Cassandra Ellis: Mr Darcy makes his book debut! Mr Darcy makes his book debut! 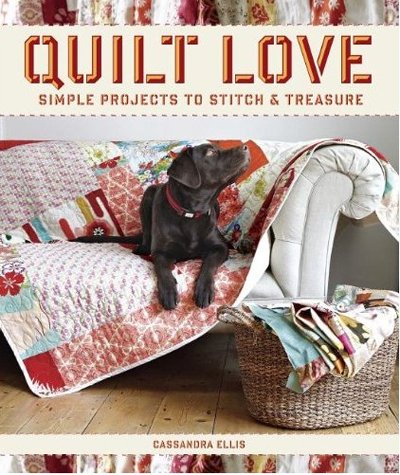 Here is the US cover of Quilt Love. Mr Darcy was only wee then - so well behaved for what is usually a very naughty dog. Lily - not so much, so no appearance from her anywhere. The US cover is really different to the UK version, but the content is exactly the same (with imperial of course). Unbelievably you can already pre-order it here. Few of us are fortunate enough to have a handmade quilt handed down through our family. In Quilt Love, Cassandra Ellis teaches her freeform design techniques, which rely in part on intuition and improvisation, to enable you to create a contemporary heirloom. Cassandra takes a refreshing, non-intimidating approach to quilting. She demonstrates how to use your eye and trust your instincts to gather together fabrics that remind you of a special time, person or occasion. This wonderful collection of 20 projects is presented in four chapters ‘Big Events’, ‘Love’, ‘Friendship’ and ‘Memories’. In addition to full-size quilts that are true labours of love, there are simple designs that you can complete in a couple of hours, including cushions, framed artworks, a tote bag, a pet blanket and a simple curtain. It is also possible to improvise – patches from any of the designs can be sewn up to make a cushion cover, for example, or used as the building blocks for more elaborate designs. Piecing together patchwork and quilts is the perfect opportunity to recycle fabric and use up scraps to make something beautiful and significant. Cassandra shows how to incorporate fragments of fabric that have special meaning, using a piece that you love as the starting point and core of your design. This could be a cherished item of clothing, a tablecloth or curtain, a piece of embroidery, or specially chosen contemporary fabric that excites you – whatever you love the look of. Cool!! Can't wait till it makes it way here to NZ. Or might have to order from Amazon. hi casssndra. comgrats on book. i have ordered mine in anticipation from mt eden book shop.cant wait. hope new house is comming together. i look forward to following progress. trills. I love your style Cassandra... can't wait to order here in the states.